While furniture woodworking is noted for its difficulty, there are some basic things that people with minimal experience can accomplish on their own to push their skills. Making a dining room table is one of these things. Here, you will find two separate free dining room table plans that you can construct with minimal skills and minimal equipment. Just click on the images to download the plans. While an octagonal surface may seem a bit more advanced than a simple rectangular shape, the truth is that it doesn't need to be. These instructions take you through the entire process in a very methodical, step by step fashion that is easy to read and follow. However, this can be a somewhat daunting project for people without much experience, so you can use the following tips to help you along if you have trouble. When you buy your plywood sheeting, you should ask the staff at the lumberyard or home improvement store if they do custom cuts. If they offer custom cutting of plywood, then you can have them cut it for you and save yourself the trouble. They will likely charge you a fee, but the fee will probably be cheaper than renting or buying a skill saw. If you decide to cut the tabletop yourself, then you should take things very slowly and deliberately. You will need at least two saw horses to do this on your own. Use a pencil, measuring tape, carpenter's square, and yardstick to draw out the borders as per the instructions. If you don't have a yardstick, use any straight piece of wood. Measure twice. Place the plywood on the saw horses so that the horses are both close to the center. Do not place saw horses near the edges of the border. Place sandbags or some other heavy, soft weights onto the center of the table. If you have large clamps, then they would be optimal. This is really just to keep the wood from moving while it is cut. Using your skill saw, cut into the wood from the edge and trim off the excess wood without getting too close to your border. Cut off all the excess. You can adjust the angle of the blade on your skill saw to anything you want. Consider setting it to 30 or 45 degrees and then cut out along the borders. This will give you a nice beveled look on the edges of your table. Make sure your main support piece is standing upright and making full contact with the floor. If you can do this on a level, cement floor in a garage or basement, then that would be best. Affix the feet to the base of the main support so that they are flush with the ground. It's very important that you take your time with this. If you rush, then your entire table will end up wobbling. Place the tabletop upside down on the ground. Measure the distances from each side to find the geometric center of the table. Measure the dimensions of the support. Using the geometric center as a starting point, draw an even, accurate outline of the support piece. This will help you ensure that your support is sitting in the exact center of the table so as to avoid any issues with stability. You always need to finish wood somehow and you always need to sand before you finish. This is a very messy procedure and it's recommended that you sand your table outside before applying finish. 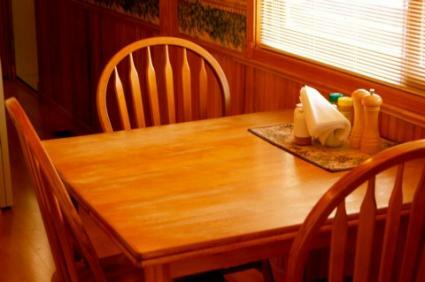 If you want to make sure the table is full sanded and smooth without running your hand over it and risking a sliver, then use a dry terry cloth hand towel. The towel will snag on any areas of the table that aren't properly sanded. 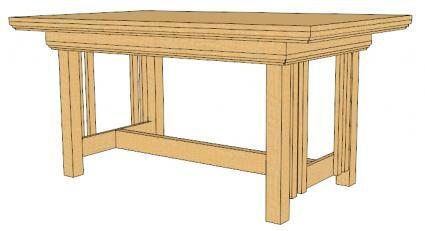 This rectangular table is manageable for people who don't have much experience with woodworking. However, it is a much more appropriate project for someone that has at least a passing familiarity with tools and woodworking. Despite the higher degree of difficulty involved, there are a few things that you can do to make the process go a little more smoothly. Place the top of the frame on the ground so that the bottom is facing up. Slide the table legs up to the edges so that they are flush against both the frame and the floor. This will help you keep the table legs even and will keep the table from wobbling. Place tabletop so that it sits evenly on the frame. Using a measuring tape, measure the distance of the frame from the edge of the tabletop. Now repeat the same process on the top of the tabletop. Add a little extra to make sure the nails hit right into the frame and mark that distance with a pencil. Assemble the whole support system independently of the table. It should look like a capital "I" when finished. Use a block of scrap wood to hold up one side of the support while you install the other side. Make sure everything is even, then install the other side. This way, your center cross support will match up nicely with the two end supports. 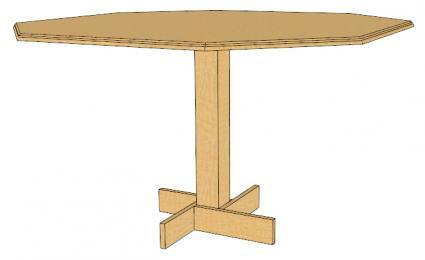 The Basic Table at WoodGears.ca is a simple table that requires a minimum of tools and experience. The Drop Leaf Table at the Woodworker's Institute is a show piece. It would be a great step forward for someone who wants to take his or her woodworking skills to the next level. This Re-purposed Door Table from HGTV is an excellent way to reuse an old door instead of throwing it away. In the end, this is supposed to be a fun learning experience. While woodworking can at times be frustrating, there is really nothing like sitting down for breakfast at a table that you built with your own hands.